CARACAS, Venezuela (AP) — Venezuelan authorities on Thursday arrested two former top officials in a widening corruption probe into the state-run oil industry that some see as an attempt by President Nicolas Maduro to consolidate power within his socialist party ahead of next year’s presidential elections. Former Oil Minister Eulogio del Pino and Nestor Martinez, ex-president of state oil company PDVSA, were arrested just four days after being removed by Maduro in a surprise cabinet shake-up. Both are accused of embezzling state funds, conspiracy and money laundering among other charges, Tarek William Saab, who took over as chief prosecutor following the ousting of one of Maduro’s top critics, said at a press conference in Caracas. As Saab was speaking, footage of the arrests was broadcast on state TV. In one sequence, military intelligence agents wearing ski masks with assault rifles drawn knock on the residence of Del Pino, who calmly opens the door and consents to being handcuffed while dressed in a jersey of Venezuela’s national soccer team. In a pre-recorded video released on social media after his arrest, Del Pino said he was the victim of an unjustified attack. “I hope this revolution gives me the right to a legitimate defense,” he said in the outdoor recording as birds chirped in the background. Saab said the arrests fulfill a government pledge to assure Venezuela’s vast oil wealth is spent on the poor and isn’t pilfered by corrupt officials with mansions and yachts in the U.S. While corruption in the country sitting atop the world’s largest oil reserves has long been rampant, officials are rarely held accountable — a major irritant to Venezuelans now struggling to eat three meals a day amid widespread shortages and triple-digit inflation. “This shouldn’t be seen as an isolated act,” said Saab, adding that 15 other PDVSA managers and officials tied to the oil probe had been arrested in the past 24 hours and a total of 65 since August. They include six executives of PDVSA’s Houston-based subsidiary Citgo, five of whom hold American passports. “What we’re doing will boost the people’s morale,” he added. 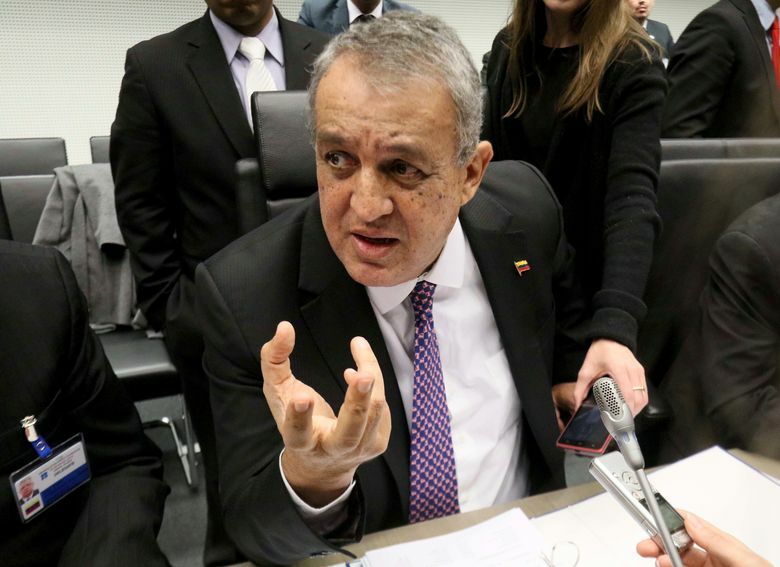 Del Pino and Martinez, both U.S.-educated industry veterans, were replaced Sunday by a high-ranking general with no experience in an oil industry that’s the source of virtually all of Venezuela’s foreign currency earnings. Specifically, Saab accused Martinez of acting improperly and against Venezuela’s national interests by negotiating a debt-financing deal when he headed PDVSA subsidiary Citgo that offered part ownership of the Houston-based company subsidiary as collateral. Del Pino allegedly profited from and helped doctor production figures in a joint Russian-Venezuelan oil field. Saab said the alleged scam deprived the Venezuelan state of more than $500 million in revenue between 2015 and 2017. Both men are also proteges of former oil czar Rafael Ramirez, who headed PDVSA and served as oil minister for a decade until becoming Venezuela’s ambassador to the United Nations in 2014. In a rare display of divisions in the ruling socialist party, Ramirez has increasingly spoken out against Maduro’s handling of the economy, even while staring down public attacks from prominent government loyalists. On Wednesday, he was reportedly fired from his U.N. post, although nobody in the government has confirmed his dismissal. The mission’s office said he could not be reached for comment and the U.N. said Thursday it hadn’t been notified of any change in Venezuela’s representation. “I’m disappointed that no type of constructive criticism is allowed, and also the fact that some comrades who know me well are victims of the right-wing’s manipulations,” he wrote in an essay titled “Stepping Firmly: Is it ethical to remain silent?” published Sunday on the Aporrea website, a forum for Venezuelan leftists. Ramirez, who was close to the late Hugo Chavez but never part of his successor’s inner circle, is believed to be the ultimate target of the PDVSA housecleaning as well as an ongoing probe in the U.S. that has led to the arrest of more than 10 individuals for paying bribes and kickbacks, including two former close aides to Ramirez arrested last month in Spain. Maduro’s anti-corruption crackdown may provide him with a needed boost and silence internal criticism ahead of presidential elections, said David Smilde, a Tulane University sociologist. Vice President Tareck El Aissami said on Wednesday that he hoped that Maduro will be re-elected in 2018, the clearest sign yet that the former bus driver will seek another term despite the deepening economic crisis. Speculation has been rising that Maduro may call elections for as early as March to take advantage of disarray within the opposition, which has been struggling to come up with a strategy to confront the president’s increasingly authoritarian rule. Still, Smilde said it’s a high-risk strategy for Maduro, who is under increasing international pressure as well as U.S. financial sanctions. Should Ramirez decide to turn to U.S. authorities for protection, as many expect, he could likely provide incriminating testimony on corruption at the highest levels of the system. Goodman reported from Bogota, Colombia. AP Writers Christine Armario in Bogota and Edith Lederer at the United Nations contributed to this report.